Right now while I am drafting this post, thoroughly enjoy watching Women's T20 worldcup match between India and Bangladesh !! So great to see their stunning performance and few sixes from the 'HarmanPreet Kaur', well done girl, what can I say ' Sikhni is Queen' :) however I am so shocked to see ground is totally empty, there are handful of kids, few women and one woman holding banner 'Proud to be a Woman' ! I am just thinking why is cricket still such a man's game, people aren't aware of the women's cricket ! It is an insult to women's cricket to be treated this way. right now I can see no difference in the matches, girls are playing with same terms and conditions as men cricket. I can see they are playing with same attitude as men, they are hungry for win. Unfortunately, cricket boards, sponsors, media celebrities and of course so called politicians , not giving enough importance to women's crickets. Women's cricket needs more visibility. Why not celebrate the sport even further, show support for women's Cricket, rather than treating women as second class citizens while we focus so much on women empowerment and their achievements. It's not enough just wishing women's only on 'International Women's Day' and share few messages on social media and talk big things, really want to show your support for women's cricket or any other game first thing first women need to support women, cheer them and make them feel that they are no less , because we need to up our game girls ! ICC and domestic cricket boards needs to bring awareness of women's cricket and expose it to public. Me and my family supporting women's cricket by watching every T20 women's cricket match #supportwomenscricket !! Behind every successful man, there is woman, and vice versa ! Why not men should be equally supportive to make every women successful too. The way we are supporting women's cricket match, we welcome new dishes too. I love to use various kind of greens heavily in our cooking, and my sunny boy can't get enough of it, he enjoys one portion of greens everyday, and it's my job to find tasty and new recipes for him. Lol we belongs to Popeye family and gain our strength, It can be included in salads, daal, curries, pasta , paratha or rice dishes. 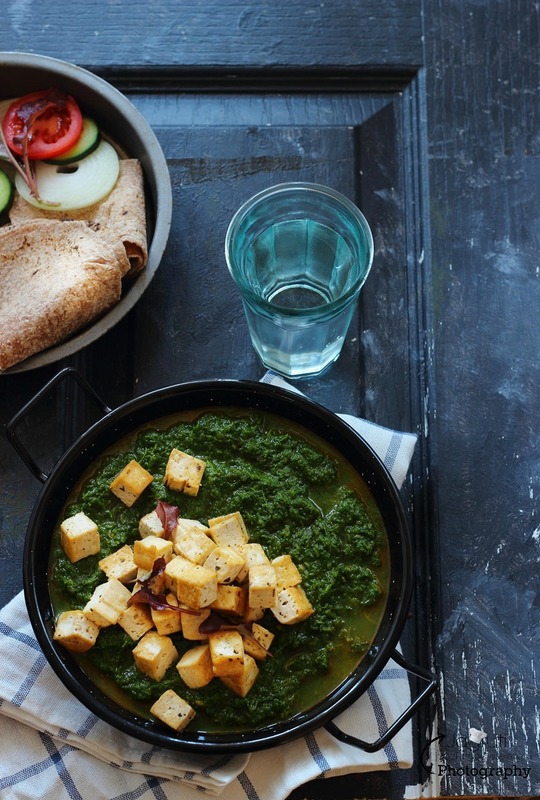 Kale and Herby Tofu Curry, shall we call it cousin of Indian Palak Paneer :) because it is with twist. 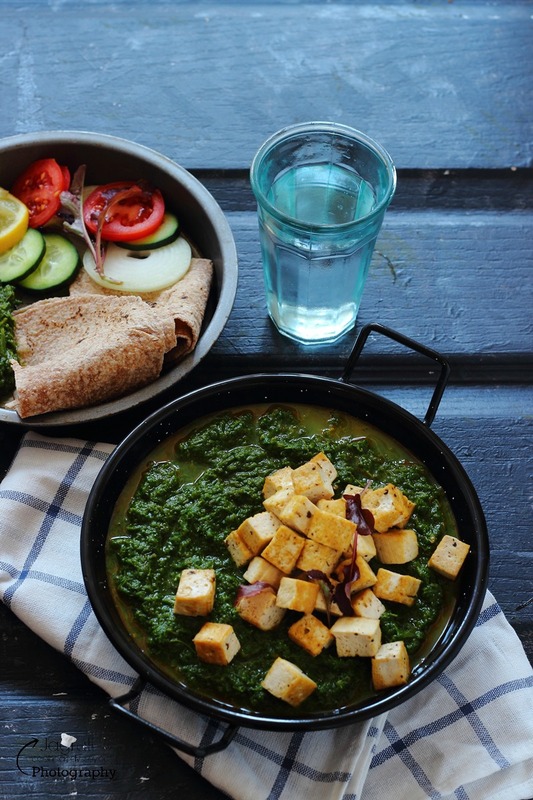 Palak Paneer, one of the most popular and consumed authentic Indian vegetarian curry served and consumed all over the world in homes and restaurants. We are an ardent fan of this simple yet magnificent curry, you can prepare this curry healthy by reducing fat content or rich and sinful by adding cream and ghee. I love to experiment, sometimes I use tofu, and add nut paste to make healthy and creamy same time, but never replaced spinach. 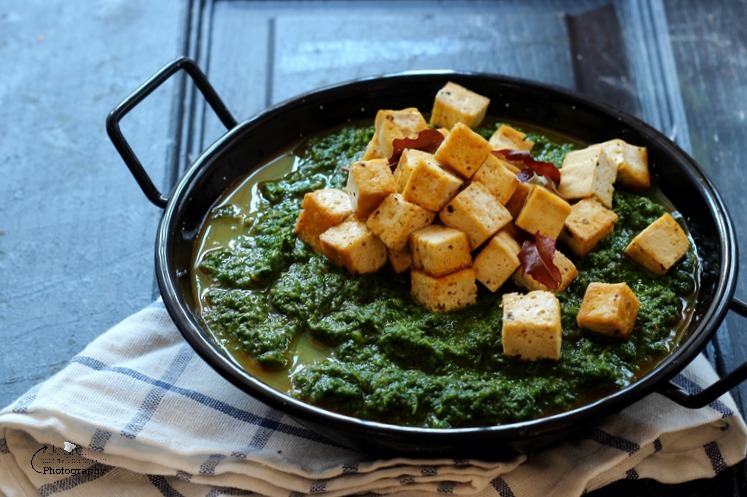 Recently on one of the food blog, I saw recipe of Kale Paneer, without giving a second thought I decided to make that curry, but I gave another twist and prepared Kale and Herby Tofu Curry as my family love to have Kale in any form. we use it in smoothie, salad even we made pesto too. 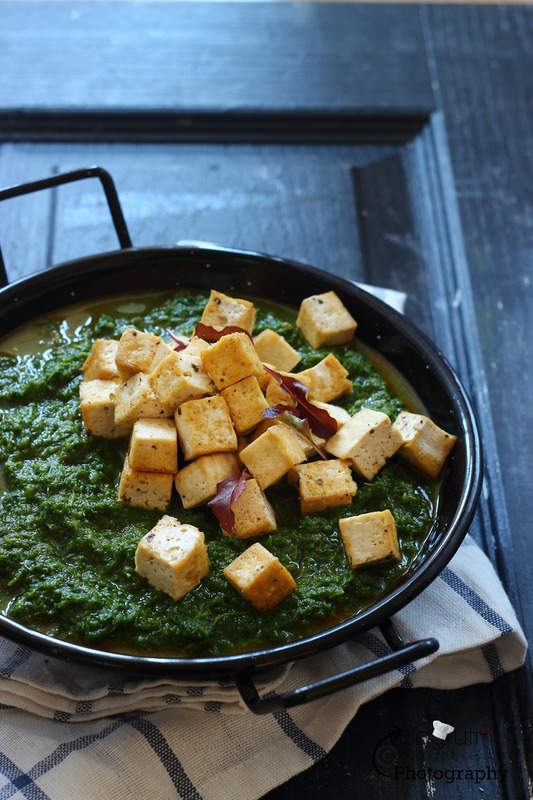 I was little nervous as I wasn't sure how the kale taste would be, so I followed same method as palak Paneer, used whole spices, kasoori methi and cashew paste to bring richness and marinated tofu to give little kick to bland tofu. You guessed right..well done girls :) Indian women won their cricket match against Bangladesh women. Drain the water from the tofu and cut into cubes. Add pinch salt, pepper powder and mixed herbs. Leave it for 10-12 minutes. Wash and clean kale and steam. Once cooled place in a blender and make coarse puree. Heat one tablespoon oil in a pan, and fry marinated tofu cubes until light brown. Remove and leave it aside. Now in same pan, heat remaining oil and add all the whole spices, once they crackle add onion and sauté until light pink. Add garlic and cook for couple of minutes more. Now add ginger chilli paste and cook few seconds more. Tip chopped tomatoes and cook until mushy and oil can be seen on the surface. Now throw all the masala powder and kasoori methi and cook for couple of minutes. Add cashew paste and cook further, add couple of spoon water if paste is too thick. Then add puréed kale and mix well. Add amchoor powder and sugar. Now throw in marinted tofu, cook couple of minutes. Jagaruti, more than recipe, I'm loving the name of this Kale - tofu curry makes my mouthwater big time!! 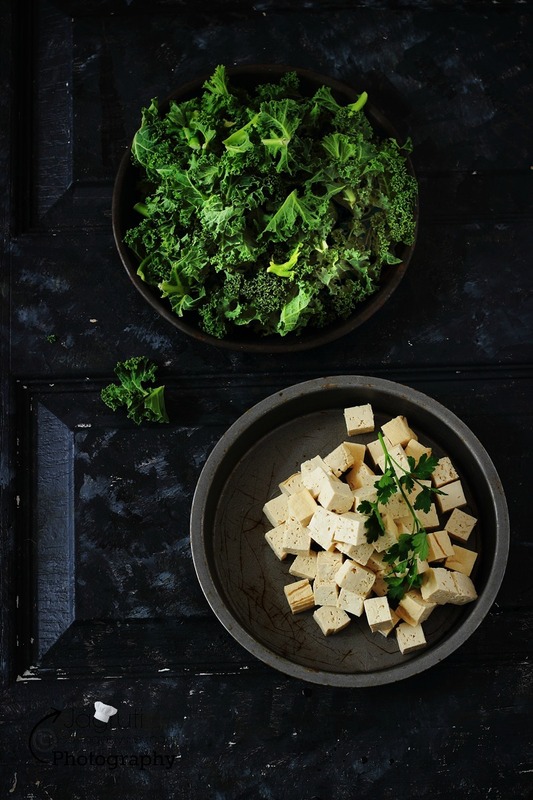 Wow, i absolutely love this recipe, love the combination of kale and tofu. So beautifully presented. It's so tempting. OMG .. this is such a healthy dish. I prefer tofu to paneer.. much lighter. This is a must try .. bookmarking it. oMG this looks so awesome, I can finish that bowl with a few hot rotis. Loved the addition of tofu to it. What a beautiful way of putting together kale and tofu in one dish...super healthy and delicious!! Who can say no to the gorgeous looking curry!! 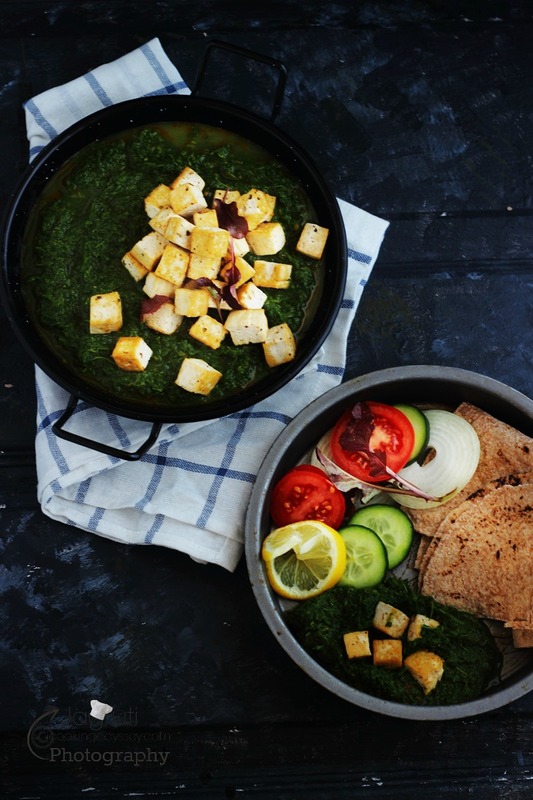 Wow that looks like a firangi version of our Palak paneer, loved the healthy twist in the recipe have to try this version soon I am sure it’s going to taste yum. This dish looks absolutely wonderful. Using tofu makes it more healthy along with greens. Wow... What a lovely dish with kale and tofu. Beautifully explained. 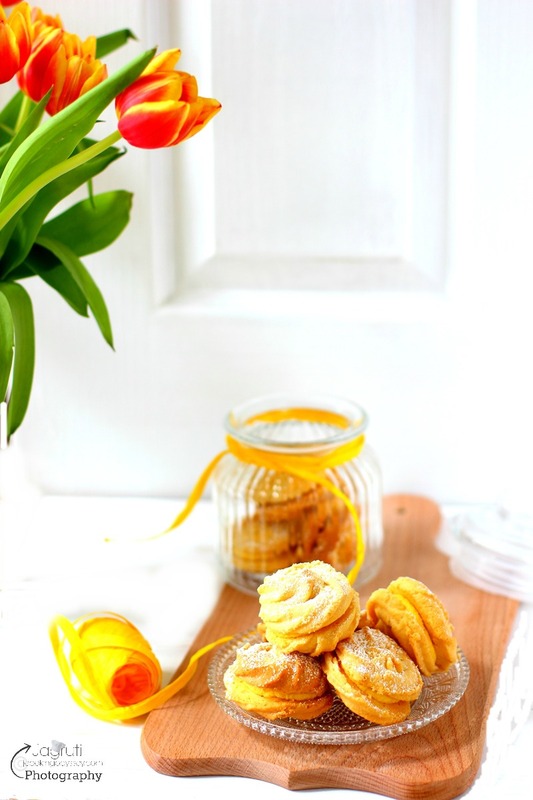 Try this recipe soon. 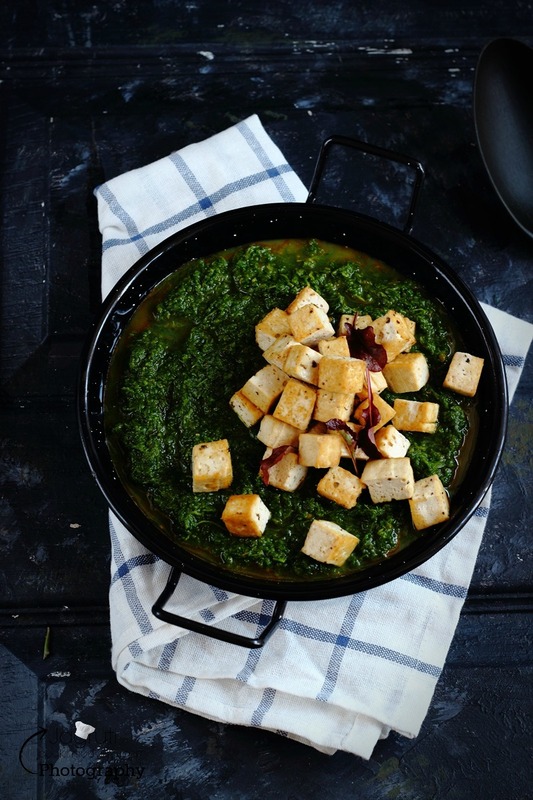 Such a healthy and delicious recipe with tofu and kale ! 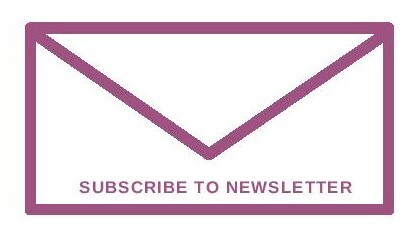 Lovely write-up..thanks for the share. 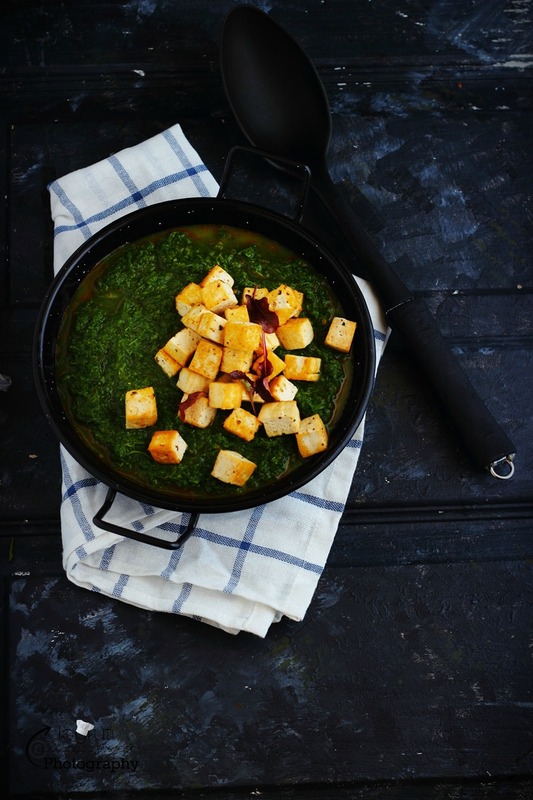 yum is this...crispy tofu and such a tempting kale curry, who will say no to this. delicious. 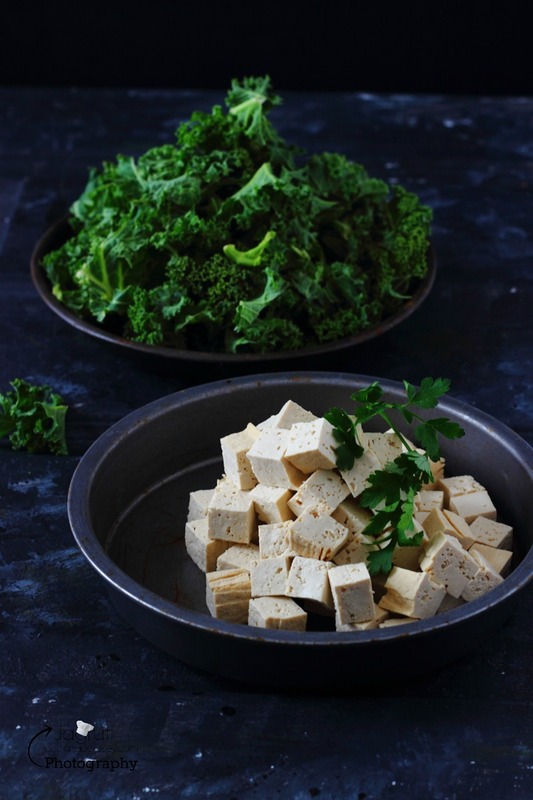 Tofu with Kale looks so ddelicious.I usually make fry with kale. This is a new recipe to try. 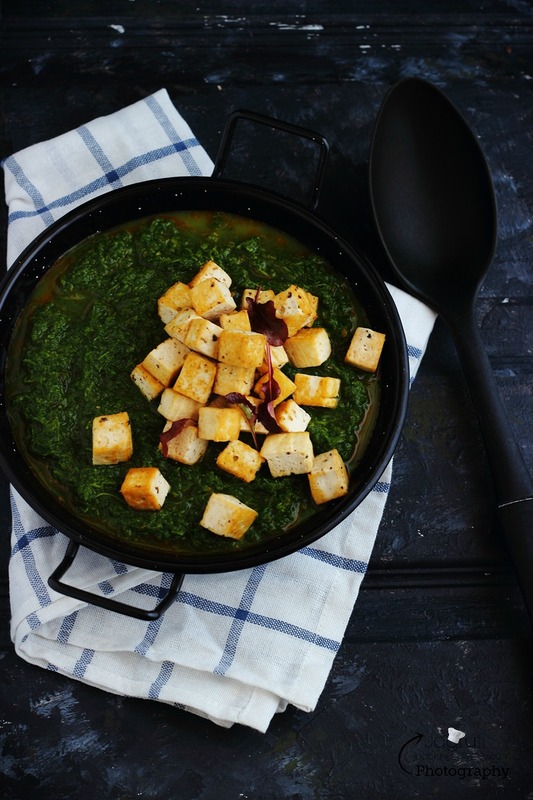 hehe, love this new palak paneer version using kale and tofu ;) As always, beautifully presented and its super tempting. The tofu kale dish looks so inviting Jagruti! Vibrant Colors, nutritious and so delicious ! Beautiful presentation Jagruti. Though I am not a tofu pan, Ill substitute this with paneer. Even i love greens and don't seem to get enough.